Posted by Runestone on Fri, 04/12/2002 - 10:46. Anyone know delay and reverb settings for the dum da da dum bit that runs thru this ditty? Posted by john on Sat, 04/13/2002 - 04:35.
: Anyone know delay and reverb settings for the dum da da dum bit that runs thru this ditty? Posted by ge on Sat, 04/20/2002 - 04:28. Posted by krystof on Wed, 04/10/2002 - 07:30.
how much i can get his classic 70's sound with only boss effects? Posted by john on Sat, 04/13/2002 - 04:38. Easily, as he did use boss quite a bit, but that 70's sound is a Fuzz Face. : how much i can get his classic 70's sound with only boss effects? Posted by gen on Sun, 04/07/2002 - 06:37. Posted by régie on Fri, 10/02/2009 - 11:57. Posted by Floyd on Sun, 04/07/2002 - 22:08. Posted by Mike on Mon, 04/08/2002 - 00:47. This popular thread has been given its own page : Re: SYD BARRETT GEAR?! Posted by Floyd on Tue, 04/02/2002 - 18:19. I don't really use it that much. So I took it apart. I found a bias switch on the inside of the pedal-you'll see it if you open yours -sometimes there covered in epoxy...but just use a hex nut to switch, and mark where it was to start off if you don't find anything you like. I switched mine a little bit from where it was, and wow. The effect isn't as pronounced and doesn't overdrive the tone when turned on. As far as I know it changed the LFO frequency. Now it may not be for everyone, but I love it. Its not as sweet you may say, but it lets YOUR tone through, before it just made my tone muddy no matter what. Posted by RIIS on Tue, 04/02/2002 - 15:19. Fender Strat (1996 Japan) '57 reissue and Fender Tele (1996 Mexico) standard. I haven't done anything to them other than shortened the tremolo for the Strat. I don't like the EMG pic-ups. Sounds like platsic. My standard vintage pics suites the older Floyd material better. I tend to stick to the Strat for most of the stuff, but I like to use the Tele for WYWH songs to get a more 77ish sound to it and ofcourse on Dogs and Run like hell. Watt. Although it's a 50W it's sounds like 200! It's amazing! Sound Citys were made between 67-73 I think and is in fact the first generation HiWatts made by the same company. I love it and wouldn't trade it for a million HiWatts! (It can be seen on the Ummagumma album cover). I use the BOSS GT-3 as a controll board for the other pedals and for reverb and different delays. For the early stuff (67-72) I use the Tube Screamer and Boss Fuzz (GT-3) with delay 310ms. For the Animals and WALL stuff I just use a clean signal with the MXR Dynacomp and the MUFF for the solo parts. Try MUFF and the Mistress together on the Comf Numb solo. It's a killer! So I don't nesseceraly use the same set up as Dave, due to lack of money and availability, but I think it's pretty close. I also tend to use different set ups or settings according to what kind og audience we're playing for. If it's a big noisy crowd I turn everyhing up and hit ever pedal I got. Posted by John W. on Sun, 04/14/2002 - 13:11. Posted by d_l_m on Mon, 04/01/2002 - 01:46. What is the best leslie sim in a pedal? I'm looking for the sound heard on Breath of DSOTM.Any help would be appreciated. Posted by Mark on Mon, 04/01/2002 - 13:14. I'am very satisfied with the H & K Rotosphere... top notch sim and build quality. : What is the best leslie sim in a pedal? I'm looking for the sound heard on Breath of DSOTM.Any help would be appreciated. Posted by d_l_m on Sun, 03/31/2002 - 20:40. Did Gilmour use a uni-vibe to get that great sound on Breath? What could I use to get that great sound??? Posted by filmour on Fri, 04/12/2002 - 14:54.
: Did Gilmour use a uni-vibe to get that great sound on Breath? What could I use to get that great sound??? Yes, he uses an univibe. Posted by numbed on Sun, 03/31/2002 - 21:44. Posted by Mike M on Fri, 09/01/2006 - 02:57. Posted by d_l_m on Sat, 03/30/2002 - 21:41. What is the difference between the delux and non-delux Electric Mistress'? Which is better and which one give the better Gilmour sound? Thanx! Posted by John on Wed, 05/15/2002 - 13:04. The deluxe mistress has a switch at the top right that acts as a filter matrix which will cut out the swirls etc, and give you a straight forward flang sound with out the extras that the Mistress has. Either one will do you well..
: What is the difference between the delux and non-delux Electric Mistress'? Which is better and which one give the better Gilmour sound? Thanx! Posted by Farley on Mon, 03/25/2002 - 06:51. Alright, this girl that likes me just bought me The Pink Floyd Collection 10-LP box set from Italy...we're not even going out...how much is this worth...I mean......have I just found the greatest girl in the world? Posted by Mike on Sun, 03/24/2002 - 20:51. Posted by filmour on Sun, 04/21/2002 - 13:01.
color at 1 o'clock, range at 2 or 3. rate at 11 or 12. Add boss-chorus (high level and depth) and the mistress will be no-noisy. Posted by mike on Tue, 04/30/2002 - 01:43. I have a Russian built Big Muff.What are the setting for the Big Muff to get the Comfortly numb sound with the . Posted by filmour on Mon, 05/20/2002 - 09:35. Sorry for my retard mike. I have an USA big muff, and my setting is: volume 2:00, tone 11:00/12:00 and sustain at 2:00/3:00. Mistress, chorus and delay remember! Posted by mike on Sun, 03/24/2002 - 21:05. Posted by matt on Tue, 09/06/2005 - 06:20. Try range and color at 11:00 and rate at 10:00. Posted by Tim Shortnacy on Fri, 03/22/2002 - 17:29. Posted by Floyd on Fri, 03/22/2002 - 03:40. Well here it begins, my thoughts and feelings about the feel of pink floyd. and analysing of video's gilmour generally plays with his fingers towards the beggining of the next fret. So if I played on fret 5, I'd move my fingers near to fret 6 rather than in the center; it gives a slightly sharper brighter feel. Next thing you'll want to do is learn to vibrato everything you can, he does his vibrato similiar to BB King, but not as intense. Which is; moving your wrist rather than the finger, which can give you some nice feeling to your music. Also he tends to vibrate everything as many musicans do; because it gives a very professional sound, and mixed with certain effects can create amazing sounds (EH Mistress, EH Muff, Delay-vibrato, and tremelo try it ; its amazing) A shortened tremelo is a great beneficial thing to have; it allows for your hand to hold it, while picking and playing its very efficient. While not neccesary its nice to have. As for picking technique I believe he still uses Herco heavy-gauge picks (as in an interview on the 77 tour I believe) They can be switched to the side which has a bumpy texture and can create a clean-scratchy/punchy feel to your music. (Page does this often as well) He is quite good at doing pinch harmonics, which when mastered add a brilliant flavour to your peice. I feel when he picks on a bend, he doesn't really pick (if he does, its very light) I think you want to lightly move your hand down over the string, and let your right hand (bend one) pick the string for you, it gives a very gently feel. His playing is also very relaxed, his hands (as many musicians) are very loose feeling; however you can often see when he gets tense playing faster songs his shoulders raise, and he usually sticks his tongue out alittle (hehe) But his playing is always loose; its a key to playing fast as well. I hope this helps someone out on alittle technique. Many people wonder what to do their guitar for a floydesque-sound. which can sound incredibly moving if played at the right moment. Learning to palm-mute and mute strings is also very valuable you'll notice in his rythem playing and songs as in Shine On solo 3; ABitW 2 solo- he plays mutes alot its a trait I think he borrowed and evolved from hendrix. Playing above fret 15 is usually reserved for climaxes with gilmour and to move the emotion level up a notch, its very effective. I commonly see him play in G-Major scales as well as G-Minor scales. Penatonics will be your friend. Major songs include; time, have a cigar, comfortably numb, hey you. Minor songs include Shine On, and some others slipping my mind right now. Amps can be a touchy subject, everyone knows he uses Hiwatts when playing live; and on DB in the studio. Fender Twin Reverb (black face) in the studio as well. He played through Selmer Bass and Treble as did Syd before hiwatt got started; later experimenting he tried Sound City (Ummugumma) and finally settling at hiwatts. In the end, all you need is a clean tone to put your effects on. Marshalls color too easily and get garbled. Hiwatts are famed for the clean tone and well un-breakable clean tone. Well here is my rant; I hope some of you like it, and someone learned something. Posted by matt on Wed, 05/15/2002 - 21:08.
: and analysing of video's gilmour generally plays with his fingers towards the beggining of the next fret. So if I played on fret 5, I'd move my fingers near to fret 6 rather than in the center; it gives a slightly sharper brighter feel. Next thing you'll want to do is learn to vibrato everything you can, he does his vibrato similiar to BB King, but not as intense. Which is; moving your wrist rather than the finger, which can give you some nice feeling to your music. Also he tends to vibrate everything as many musicans do; because it gives a very professional sound, and mixed with certain effects can create amazing sounds (EH Mistress, EH Muff, Delay-vibrato, and tremelo try it ; its amazing) A shortened tremelo is a great beneficial thing to have; it allows for your hand to hold it, while picking and playing its very efficient. While not neccesary its nice to have. As for picking technique I believe he still uses Herco heavy-gauge picks (as in an interview on the 77 tour I believe) They can be switched to the side which has a bumpy texture and can create a clean-scratchy/punchy feel to your music. (Page does this often as well) He is quite good at doing pinch harmonics, which when mastered add a brilliant flavour to your peice. I feel when he picks on a bend, he doesn't really pick (if he does, its very light) I think you want to lightly move your hand down over the string, and let your right hand (bend one) pick the string for you, it gives a very gently feel. His playing is also very relaxed, his hands (as many musicians) are very loose feeling; however you can often see when he gets tense playing faster songs his shoulders raise, and he usually sticks his tongue out alittle (hehe) But his playing is always loose; its a key to playing fast as well. I hope this helps someone out on alittle technique. : Many people wonder what to do their guitar for a floydesque-sound. : which can sound incredibly moving if played at the right moment. Learning to palm-mute and mute strings is also very valuable you'll notice in his rythem playing and songs as in Shine On solo 3; ABitW 2 solo- he plays mutes alot its a trait I think he borrowed and evolved from hendrix. Playing above fret 15 is usually reserved for climaxes with gilmour and to move the emotion level up a notch, its very effective. I commonly see him play in G-Major scales as well as G-Minor scales. Penatonics will be your friend. Major songs include; time, have a cigar, comfortably numb, hey you. Minor songs include Shine On, and some others slipping my mind right now. 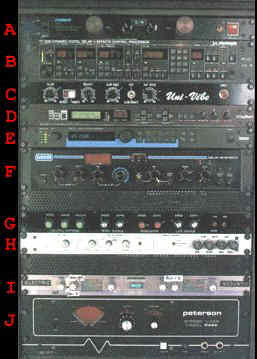 : Amps can be a touchy subject, everyone knows he uses Hiwatts when playing live; and on DB in the studio. Fender Twin Reverb (black face) in the studio as well. He played through Selmer Bass and Treble as did Syd before hiwatt got started; later experimenting he tried Sound City (Ummugumma) and finally settling at hiwatts. In the end, all you need is a clean tone to put your effects on. Marshalls color too easily and get garbled. Hiwatts are famed for the clean tone and well un-breakable clean tone. : Well here is my rant; I hope some of you like it, and someone learned something. Posted by John on Fri, 03/22/2002 - 07:21. I agree that no matter what effects you have, you've gotta develop style. Practice and listening are key!! Gilmour has a keen sense of knowing what sounds good and where. Improv puts him as one of the best guitarists of our time. RAT,CTD, Soft Sustain, , Fuzz Face, P-2 Fuzz, Then the Muff. Each adds a different color to the Solos and rhythms. But I gotta say that I believe Gilmour really only uses the RAT for the dry Money Solo. The Tube Driver seems to be his preference as of late for Rhythm Distortion. The Muff and or P-2 fuzz would be his in your face distortions as of late. The Fuzz Face is no longer on his rack! For the Over driven tones, I find that just the amp with the SPC on the DG20-s give the signal a nice warm feel with power. Add a compressor in there and it does a nice job. Can't say enough about the misstress. This is THE flanger for the Wall, actually for all the Floyd stuff. Delay - I can not stress this enough, Learn to play the delay. It is an instrument on its own and can either help you or destoy you. Some songs its prevelent, others its barely noticable. Like Floyd said, Most of us can't afford a $2000 unit that has a signal level detection in it to delay the weakest part of the signal, so play with the level on the pedal to see where it sounds good, almost not noticable, but there to fatten up your sound. Too much delay will kill you. Guitars - Floyd live tends to be the Strats, but any guitar in Dg's hands tend to sound good. He did use the Steinberger in the 80's quite a bit and I believe he recorded a few songs with that for the Momentary Lapse LP. AMPs- Hiwatts, Fenders - TUBE!!!!! Picks I believe he uses the Tortex Greens now. Thought I'd add my 2 or three cents here. : Well here it begins, my thoughts and feelings about the feel of pink floyd. Posted by John on Fri, 03/22/2002 - 07:20. I agree that no matter what effects you have, you've gotta develop style. Practice and listening are key!! Gilmour has a keen sense of knowing what sounds good and where. Improve puts him as one of the best guitarists of our time. Posted by Floyd on Fri, 03/22/2002 - 15:11. Ah yes-I forgot all about the fuzz face. You'll want a vintage one, I hear the new ones are not very good at all. I remember seeing a site around that the guy would put vintage specs in your reissue-you'd have to search around. Yes I agree with the rat. However I think it has a great overdrive tone to it. Things like the P-2 Fuzz, and soft sustain are also like 400$ effects; which I'm sure sound excellant, but alittle out of my price range and most others; hence lack of showing it here. I think importantly to find a good overdrive though. I totally agree he is one of the best improv guitarists. If you listen to early bootlegs on songs like fat old sun, embryo, careful with that axe eugene-you'll hear it, and its damn amazing. Posted by Ralph on Tue, 03/26/2002 - 05:28.
: Ah yes-I forgot all about the fuzz face. You'll want a vintage one, I hear the new ones are not very good at all. I remember seeing a site around that the guy would put vintage specs in your reissue-you'd have to search around. : Yes I agree with the rat. However I think it has a great overdrive tone to it. : Things like the P-2 Fuzz, and soft sustain are also like 400$ effects; which I'm sure sound excellant, but alittle out of my price range and most others; hence lack of showing it here. I think importantly to find a good overdrive though. : I totally agree he is one of the best improv guitarists. If you listen to early bootlegs on songs like fat old sun, embryo, careful with that axe eugene-you'll hear it, and its damn amazing. Posted by Floyd Trivia on Wed, 03/20/2002 - 21:41. Posted by j_hotch on Thu, 03/21/2002 - 19:46.
house of the rising sun?!? Posted by the squirrel on Wed, 03/20/2002 - 18:05. This popular thread has been given its own page : house of the rising sun?!? Posted by Ralph on Wed, 03/20/2002 - 13:02. Posted by Leo on Tue, 03/19/2002 - 18:17. This is not exactly Gilmour related, but since many of us here own Phase 90's and at the same time are electronics savvy, I thought someone might be able to help me. My Phase 90 stopped working one day. Somehow, I cannot power it up, regardless of whether I use an AC supply or a battery. Moreover, when I connect my power supply to it, all my other effects on the daisy chain fail, so it seems that I have a continuity problem within the unit. I opened it up, but I no nothing about circuit boards, and there were no obvious problems that caught the attention of my untrained eyes. Anyone know if this sounds like a simple and common problem for which there is a do-it-yourself cookie cutter remedy, or must I take it to a pro? Thanks in advance. Posted by chris on Fri, 05/07/2004 - 02:16.
and it is warmer and smoother and has had no probs.You can find them for about the same price as the 100 ressiue. Posted by chris on Fri, 05/07/2004 - 02:11.
: This is not exactly Gilmour related, but since many of us here own Phase 90's and at the same time are electronics savvy, I thought someone might be able to help me. : My Phase 90 stopped working one day. Somehow, I cannot power it up, regardless of whether I use an AC supply or a battery. Moreover, when I connect my power supply to it, all my other effects on the daisy chain fail, so it seems that I have a continuity problem within the unit. I opened it up, but I no nothing about circuit boards, and there were no obvious problems that caught the attention of my untrained eyes. : Anyone know if this sounds like a simple and common problem for which there is a do-it-yourself cookie cutter remedy, or must I take it to a pro? Thanks in advance. Posted by Mike on Sun, 02/20/2005 - 18:41. Yo I got the same problem. I used a 9V ac adapter and the light went on then off, and it didnt work completely. I then used a 9.6 V ac adapter, and now it only works halfway meaning, i can go through it and have osund come out of the amp, but when i switch it one, there is no effect and no sound. I think using a different AC Adapter messed up the circuits. I wrote to JIm Dunlop, and I am still waiting to hear from them. Posted by mipo on Tue, 03/19/2002 - 22:53. Leo, if you don't already know about it, you may want to visit www.hail-eris.com/~stompbox, Aron Nelson's stompbox forum. I'm sure someone there could help you out. Take care. Posted by ulatek on Tue, 03/19/2002 - 00:32.
should i go with phase 90 or small stone? and also should i go with dynacomp or cs-2? Posted by RALPH on Tue, 03/19/2002 - 06:06.
: should i go with phase 90 or small stone? and also should i go with dynacomp or cs-2? What does Gilmour use for reverb? Posted by Gstring on Mon, 03/18/2002 - 18:12. Does anyone know what Gilmour uses for reverb in his guitar rig. I would think the pcm 70 would do a good job, but I have read he only uses it for multi-tap delays. Re: What does Gilmour use for reverb? Posted by matt on Tue, 09/06/2005 - 05:22. He doesn't use reverb live but uses the natural reverb in the concert venue and also delay. : Does anyone know what Gilmour uses for reverb in his guitar rig. I would think the pcm 70 would do a good job, but I have read he only uses it for multi-tap delays. Posted by john on Tue, 03/19/2002 - 17:14. Posted by Farley on Mon, 03/18/2002 - 04:46. Posted by chris on Sun, 05/05/2002 - 18:22. Dont take the whole thing off to adjust the action just get an allen wrench and use that on the pole screws on the bridge saddle.